The Studioli and the Open Depot are open in the framework of our tours Behind the Scenes. We offer all our visitors access to WiFi free of charge. Just connect your mobile device with the “Liebieghaus_WiFi” WiFi and discover our digital offers for your visit to the Städel! No password is necessary. Take an art break and round out your visit to the museum in a relaxed atmosphere! With its Gründerzeit villa, historical interiors and enchanting riverfront garden, the Liebieghaus offers a unique ambience for your event. In these special surroundings, you can offer your guests a memorable art experience. Apart from the attractive main foyer and the atmospheric garden, you have the historical fireplace room (50 square metres) and the exclusive Café Library (30 square metres) at your disposal. Our facilities provide the perfect setting for receptions, workshops, seminars and meetings. The use of our interiors for private gatherings is reserved for patrons of the museum. Within the framework of an accompanying or guided tour programme tailored to the individual needs of your guests and your event, an exclusive visit to the Liebieghaus collection and special exhibition is also possible. The admission fee admits visitors to the special exhibition(s) and the permanent collection. Discover the Liebieghaus sculpture collection with an audioguide. The audio guide can be hired at the cashier’s desk for 4.5 euros or 8 euros for two. For reasons of safety, visitors must deposit bags (larger than DIN A4) and jackets in the cloakroom. To prevent accidental damage to the artworks, visitors are prohibited from carrying articles of clothing over their arms in the exhibition rooms. The consumption of food and beverages is not permitted in the exhibition rooms, nor may any fluids be brought into these rooms. The cloakroom is at your disposal for the deposit of such items. Changing tables are installed in the restrooms in the basement for the care of infants and small children. Owing to the fact that the Villa Liebieg is a historical building and listed monument, a small proportion of the museum is not accessible barrier-free. Visitors with a 50% or higher degree of disability pay the reduced admission fee. If the certificate of disability is marked with the letter “B”, admission for one accompanying person is free of charge. For security reasons, we reserve the right to regulate access to the exhibition rooms with prams and pushchairs when necessary (e.g. in cases of high visitor volume). Space is available for depositing prams/pushchairs. Take an art break and round out your museum visit in a relaxed setting. 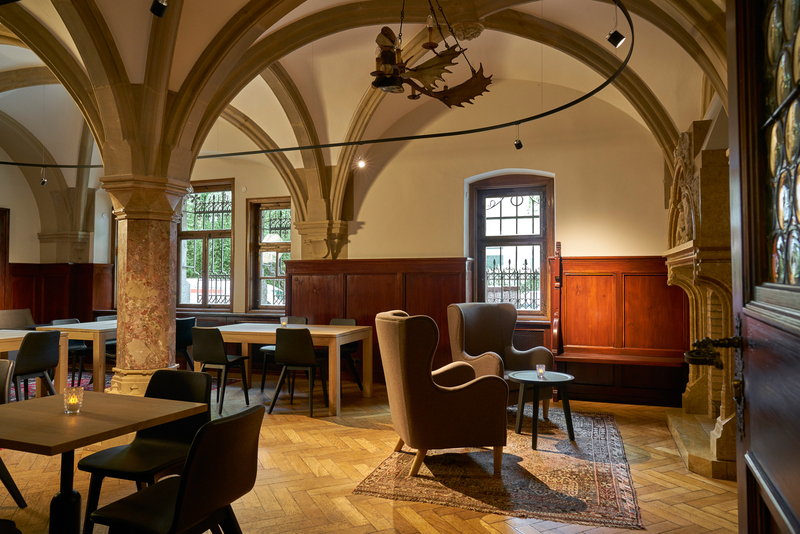 The Liebieghaus Café is a Frankfurt institution – with its delightful, friendly atmosphere and popular home-made cakes, tarts and quiches, it has a character all its own. The use of cameras for private purposes is permitted in the permanent exhibition rooms and in special exhibitions unless otherwise indicated for a specific artwork. Flash, additional light, tripods, selfie-sticks and other technical aids are prohibited. Cameras, audio and video recorders may be used for commercial or publication purposes only with written permission from the Liebieghaus Skulpturensammlung. To obtain permission, please contact our press department presse@liebieghaus.de prior to your visit. Without prior permission, the commercial use of all photographs and audio and video recordings is prohibited. In the event that you would like to purchase reproductions of artworks and reproduction rights, please contact our image agency Artothek www.artothek.de. Artothek can supply digital files and Ektachromes, and offers access to an image database for research purposes. The use of the Liebieghaus cloakroom is free of charge. The cloakroom is located behind the entrance hall on the left. Visitors are required to deposit the following items in the cloakroom: jackets, bags (larger than DIN A4), daypacks, umbrellas, and large objects. No such items may be taken into the exhibition rooms. As space is limited, it is not possible to leave suitcases or trolleys in the cloakroom. Lockers are available, for which a 1-EUR or 2-EUR coin is required. The Liebieghaus accepts no liability for items deposited in the cloakroom or the lockers. Families with up to two adults and their own children and grandchildren under 18 can purchase a family ticket for 18 euros. Please be advised that family tickets and reduced-rate tickets can be purchased only at the Liebieghaus cashier’s desk. Presentation of valid proof of eligibility is required. The Liebieghaus offers guided tours as well as studio and holiday courses especially for families and children. Offers such as guided tours with workshops can also be booked individually. Gift certificates are available for purchase at the museum cashier’s desk and in our online shop. Gift certificates are valid for a visit to the Liebieghaus Skulpturensammlung, the Café im Liebieghaus, the museum shop and the online shop. Gift certificates and free tickets to the Liebieghaus Skulpturensammlung are valid for three years from the date of issue unless otherwise indicated on the certificate/voucher (regular limitation period according to § 195 BGB). The gathering place for guided tours is outside the main entrance to the Liebieghaus or, in the event of bad weather, in the Liebieghaus foyer. ICOM cardholders are entitled to visit the museum free of charge. Please ask for a free ticket at the cashier’s desk. The Museum Embankment Card and Museum Embankment Ticket entitle their holders to free admission to all participating Frankfurt museums. Priority admission is not covered by the offer and unfortunately also not possible during special exhibitions. Please consult the museum cooperation pool guidelines for the Museum Embankment Card and the Museum Embankment Ticket. On presentation of your Museum Embankment Card or Museum Embankment Ticket plus photo ID at the desk, you will be issued a free admission ticket. Current museum publications and gift items related to the exhibitions are on sale in a section of the Liebieghaus entrance hall. The shop opening hours correspond to those of the museum. To make a purchase from the shop, no admission ticket to the Liebieghaus is required. The online ticket can be presented as a printout or as a mobile ticket on your smartphone screen. Online tickets cannot be exchanged or returned. Please note: family tickets and reduced-rate tickets can be purchased only at the Liebieghaus cashier’s desk. Valid proof of eligibility is required. The current opening hours are posted under Information & Service. Please be advised that there are no parking spots for museum visitors in the direct vicinity of the Liebieghaus. Please use the nearby multi-storey car parks. It is not possible to reserve a coach parking spot in advance. There are several coach parking spots near the Liebieghaus. For journalists, bloggers and online disseminators, we have set up an online newsroom. Here you will find all information of relevance to the media, including press releases and press images on the Liebieghaus Skulpturensammlung exhibitions and projects. Portable folding stools are available for visits to the exhibition rooms featuring the permanent collection. For safety reasons, the museum personnel reserve the right to regulate the use of stools in special exhibitions. Wheelchairs are available for persons with limited mobility. The Städel Museum is located just a few minutes’ walk from the Liebieghaus Skulpturensammlung. Under a single roof, the Städel offers a virtually complete survey of seven hundred years of European art – from the early fourteenth century to the present, with focusses on the Renaissance, the Baroque, early modern art and much more. The holdings encompass altogether more than 3,100 paintings, 660 sculptures, some 4,600 photographs and over 100,000 drawings and prints. For members of the Städelverein and the Städelclub, admission to the Liebieghaus collection and all special exhibitions is free of charge at all times, with no queueing. We offer free WiFi to all visitors. Connect your mobile device to “Liebieghaus_WiFi”. No password is required.